I cannot believe that there are only twenty-five days remaining in 2018! The year has flown by for me and I am really excited for a fresh start (this year has had the lowest of lows for me). But before I skip on into the new year, I wanted to do the end of the year book tag! Many thanks to Abmost Fiction and Destiny @ Howling Libraries for tagging me, we all know that I love a good reflection! I also have four books on my ‘Not Now’ shelf, and although I am not likely to get to all of them, it would be nice to wrap up these as well! All of these books I picked up but wasn’t in the right mood or mindset to read; with This Cruel Design and Vengeful it is actually fear based and I have an upcoming post talking about that. I am anxiously awaiting my copy of Stronger, Faster, and More Beautiful by Arwen Elys Dayton to arrive and it is my last 2018 release! I was really excited to see it was this month’s pick for the Mysterious Galaxy Book Subscription after seeing Justine’s review! Uhh.. I listed 9 in the first question. If I had to choose which three from that list: Illuminae, Firefly, and Vengeful. It’s possible! I am really excited for Illuminae because it is a SQUAD Buddy read and we are reading along with the audiobook – which I have heard is full cast and incredible. I have so many books to finish too! I can’t believe it’s already December. Looks like you’re making great progress on yours, though! I’m hoping to start the Illuminae Files next year. Happy reading! AH! I am on the blog tour for Stronger, Faster and More Beautiful! Very excited to read it! I just went to my local bookstore this AM to see if they had Stronger, Faster but no dice! I’m very curious about that one as well! Love your answers, Kaleena! I ASPIRE to have my blogging life as put together as you do. ❤ I'm hoping to read Illuminae soon, and am dying to see your thoughts on it! I've heard the audiobook experience is wonderful as well, but I'm horrendous at reading audiobooks, so I'll probably just stick to the paperback I have for it. Hahaha! Happy reading, love! Thank you so much for tagging me, Kaleena! Tbh, this tag is making me anxious since I’m such a mood reader. But nonetheless, I think this is quite a fun tag to do just to check if you still have something up your sleeve. I love Illuminae! It was one of the best books I read in 2015 and it got me hooked on sci-fi. Kady Grant is basically my hacker mom. 💕 I hope you have a fantastic time with the audiobook. WAIT FOR ME WITH THIS CRUEL DESIGN I’M STILL WAITING ON THIS MORTAL COIL. Also you need to read Six of Crows ASAP. I implore you to move it up your TBR as I have with This Mortal Coil. I liked Illuminae but didn’t love it. I’m still waiting my copy of the last Throne of Glass book. Hopefully you’ll get your copy of Stronger, Faster, and More Beautiful soon. OKAY YOU HAVE TO WAIT TO READ CRUEL DESIGN. I JUST GOT MORTAL COIL YESTERDAY. AND HELL YES TO ILLUMINAE!!!! OH MY HEART IS SOARING THAT YOU ARE READING/LISTENING TO THIS. 10/10 would recommend. GOLD. OKAY OKAY OKAY! I suppose the good thing about my FAILING on my squad buddy read of TCD is that I can try again to read it with you when you get to it! I hope that you enjoy the book as much as I did!!! Illuminae is INCREDIBLE. Currently on page 150 but plan on spending a good amount of today reading & listening! Uh… yea, SoC. We need to get that albatross from our necks! Its not failing if you squint your eyes and crane your neck to the side. So boom! you are winning! Plus now you will get the chance to experience my ever the great commentary. A time shall be had. I’m currently reading Once Upon a River! I had every intention of reading it before its release date, but it just didn’t work out. I’m only a few pages in! What is the Firefly book you’re reading? I LOVED the series and was super bummed when they cancelled it after one season. However, they just started a new comic that picks up right after, and it’s fabulous! They’ve only published the first issue, and I’m really looking forward to the next one. I am strangely glad that I am not the only one that missed the release date for Once Upon a River! I feel really bad, but I know better than to try and force it when I am not in the mood. I hope you are enjoying it! The book is called Big Damn Hero by James Lovelace and Nancy Holder, and is the first of 3 new books in the ‘verse! I also loved the show so much and still mourn its cancellation, but also live in a world where the movie does not exist. These books pick up after the show and before the movie. Happy me. I will have to check out the comic, do you have info on it?! I love the audio for Illuminae Files. I listened to all three after reading them and enjoyed it so much. The audio is INCREDIBLE! Honestly with the unique format of the book, I feel like reading along with the audio is how it was meant to be consumed and I freaking love it. 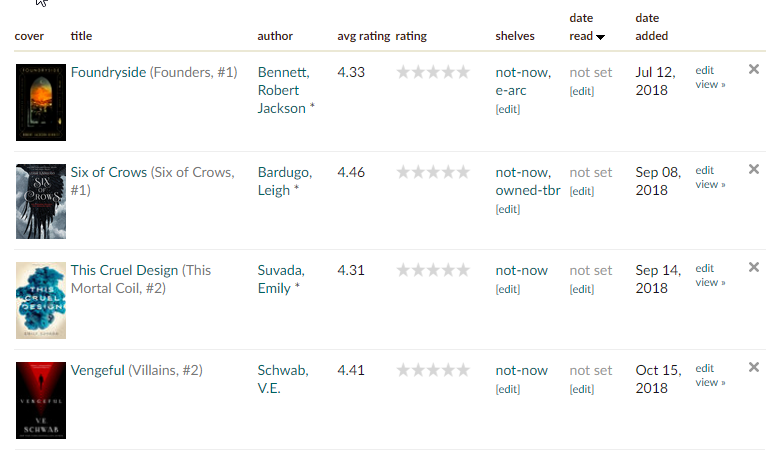 I was on a book ban for the rest of the month, but, uh, I need Gemina and Obsidio immediately! Gemina is my favorite, but I loved all three. It’s one of my all time favorite series. I can’t wait to hear what you think once you’re all done. I can’t wait to share my thoughts! Even though I haven’t read since Friday oops. Hahaha yea, plenty to keep me occupied this month for SURE! Thankfully I am taking the last 2 weeks of the month off of work, so hopefully I will have some extra time for reading! 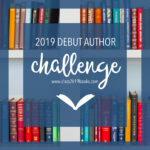 I do have a plan because I am obsessively Type A, but have you seen my awesome 2019 book blogger spreadsheet template?! Because you can also be super organized if you want, for free! Here’s the link to the post! There’s a lot there so I understand being intimidated! Let me know if you ever have questions or want some help. Also also, do you have a more current blog? What is attached to your WP profile is a blog with a farewell message from 2013 as its most recent post. I’d love to comment/visit back if you have a more up to date blog. I do have to work during summer break as I am not an instructor (I work in philanthropic fundraising for faculty research and student support), but working for a public university (aka I technically work for the state of California), I get a bunch of public holidays. Which is nice! This is a great tag. I have quite a few books that need reading, and things that need to get done before the year is done. Gah. Now I need to make a reading plan. You are so organized!! So much to do and so little time, I can’t believe how fast time is flying by! I hope you are able to accomplish your goals before the new year, Beth! Me too! But if I don’t that’s ok! On to the next year! THE Illuminae AUDIOBOOK HAS A FULL CASTTT???? WAHAAAA? I am rushing off to my friendly neighborhood online library as we speak to reserve myself a copy. IT DOES! I REPEAT! FULL CAST and it is INCREDIBLE!?!?!? I am about 150 pages in and honestly??? The unique format of the book with the full cast audio go so perfectly together, it is almost like this was the intended way to read it! I’m so happy to hear you are enjoying Illuminae! I saw a review of Once Upon a River yesterday and it was glowing. Hope I enjoy it that much! Hi Sophie, thank you so much for your comment! I am LOVING Illuminae so far, it is fantastic! I read the first chapter of Six of Crows about 6 weeks ago and can tell I will really like the book, it just wasn’t the right time for me. Hopefully the stars will align soon. Happy reading! I will get around to it one of these days, hehe. It’s a buddy read and Sam is equally meh about picking it up right now for some reason. Goodness I don’t even want to think about all of the books I started this year that I didn’t finish. I hit a reading slump and couldn’t stay engaged with ANYTHING for all of summer. I had never heard of Stronger, Faster, and More Beautiful until this post but I am adding it to my TBR! I’m a huge fan of Black Mirror and anything dark science fiction. Oh no, slumps are the worst! And I don’t know about you, but I always struggle to go back to books I set aside as “not right now” reads. I’m dying to read Stronger, Faster, and More Beautiful – I got an e-ARC, but I haven’t had the time to read yet. *hides in shame* Good luck on reading all those books before the year ends. No shame, I am behind on a couple of ARCs too… I think it happens to the best of us! I am excited to read it as well, I think my copy arrives today. Yay!